Obviously, the time of day you have to leave property if a key factor to how much you can squeeze in on your departure day. The following ideas have a range of time that they will take, and a varying activity level. I hope you find something fun for your family! A galaxy far, far away needs your help. You'll be transported with family and friends in a brand new hyper-reality experience called The VOID. Push the boundaries of location-based virtual reality as you find yourself walking into the action on the molten planet of Mustafar. The VOID opens a whole new world in entertainment. Chances are you've never experienced anything quite like it. Perfect for beginning golfers and families, Fantasia Gardens Miniature Golf Course lets you putt your way through 5 whimsical scenes featuring tutu-clad hippos, marching broomsticks and pirouetting ostriches. 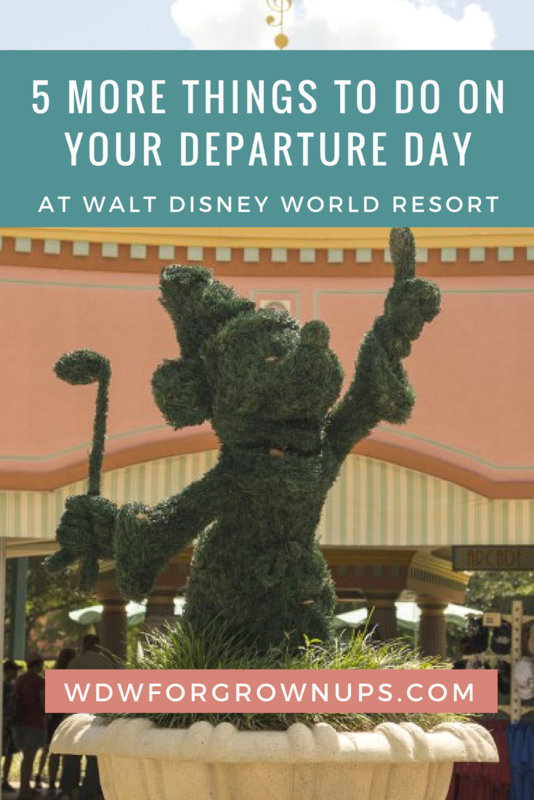 Mickey may just have a surprise or two up his magical sleeves while you play this fun filled course. Gather the clan to make a few last magical memories with a Mini Portrait Session at any Walt Disney World Resort. These casual shoots can be booked for either 20-minute, or 60-minute sessions with a professional Disney photographer at one of many beautiful Resort settings. High-res photos in jpg format will be delivered on a flash drive immediately after the session. Walt Disney World Resort Hotels have a check-out time of 11:300 a.m., which means that if your squeezed every last ounce of fun out of the night before, you can sleep in. I'm pretty fond of this option myself, and some of my most luxurious Disney mornings have been on departure days. Sleep in, take your time packing up, and if you are in a Disney Deluxe Resort, order room service for breakfast. On the other hand, if you are having a rough time saying goodbye, this might be the perfect morning for a Resort Hotel Character Breakfast. 'Ohana at Disney's Polynesian Resort is pretty popular and features Lilo & Stitch. My favorite is Cape May Cafe' for Minnie Mouse and Donald Duck. What do you like to do on your departure day? Leave a comment below and share your traditions. Disney Springs,mainly for the Christmas Shoppe, pick up a few snacks from the Goofy Candy Co, get a free chocolate square for Ghirardelli and grab an awesome sandwich from Earl of Sandwich before we leave. Or, we take a last leisurely stroll around the Boardwalk and check out the resorts, maybe even take the ferry just because. If we are staying at POFQ, we love taking the boat from there to Disney Springs via the Sassagoula River. It's a great ride and very relaxing. Since we always have a car we sometimes go visit resorts, especially if it's around the holidays. Oh, and we may hit up the Character Warehouse Outlet for a few last minute bargain souvenirs. We need to add an extra day just to account for all the last day things I like to do! I agree Jeff, there is so much to do outside of the Parks! I've found that I can actually do with just one or two Park days on a trip because there is so much other fun to be had! Go to Magic Kingdom and defeat one more villain in Sorcerers of the Magic Kingdom. Go to Epcot, visit France and get a packable lunch. It's likely less expensive and better tasting than what's at the airport. Visit the Grog Grotto (Poly), have a drink and get a souvenir Tiki mug. Make a tradition and buy (for us) Jelly Belly combo of licorice, cherry, and red hot. Marc, Disney Springs has a new spot that is specializing in packable lunches. It's called "The Basket" at Wine Bar George and the whole concept is that you can build your own picnic! I was thinking my daughter and I might do that. The only problems is that these days you never know what will get through security and I would hate to pack a great lunch only to have it taken by TSA.